CALUMET — When it opened its doors five years ago, OcuGlass had four employees. The company is now reporting that sales are up and they have recently hired six new employees. “When I started, there was one shift, there was seven people and we’re at 30 right now,” said foreman Brandon Kaipio. Kaipio says that he and his coworkers have become close friends over the year and a half that he’s worked for the company. “We become friends at work and we do hang out with each other and spend a decent amount of time outside of work, probably the same amount of time at work, we spend outside of work.,” he added. 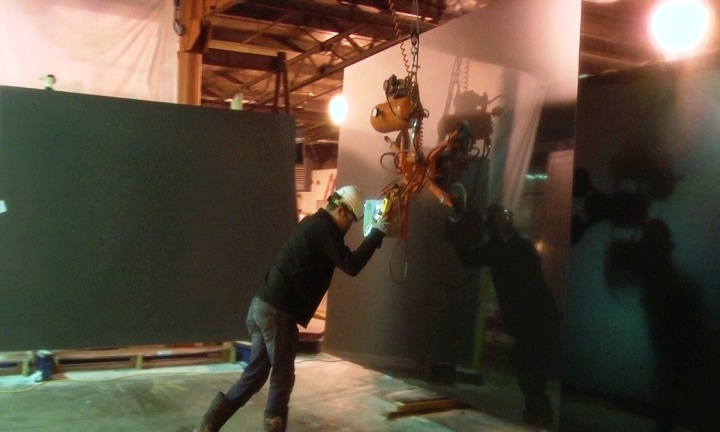 The company has developed a unique glass etching process that takes large pane of virgin glass and adds a frosty appeal to the surface before it makes its way to tempering plants and then to its final destination. “Basically we start by cleaning the glass in one tank and we run it through a frosting tank that puts the white frosting look on the glass like shower glass kind of. Then we end it in a acid tank that brightens it depending on the level that we are doing,” said Production Supervisor Brant Ryynanen. This piece is a bronze shaded mirror that will most likely compliment the lobby of a high end hotel. Another application for the finished product is making its way into board rooms throughout the corporate world, as a dry erase board. “One of our processes is a writable board and basically that’s used in a lot of offices. It’s very easy to clean. Its our best looking product,” said Ryynanen. In addition to offices, other completed pieces produced by the Calumet-based operation can be found in sky scrapers, airports and high profile venues around the world.